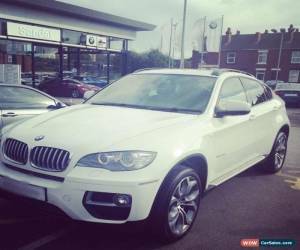 BMW X6 3.0 40d xDrive 5dr - 63 plate! 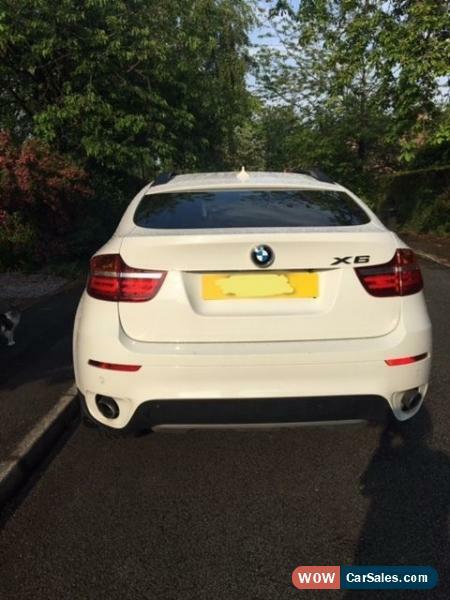 BMW X6 3L X-drive 40d, Alpine White. Fully loaded with all extras! Ex demo car! One owner bought from Sandal BMW wakefield, selling for smaller car. Full BMW service history, approx 40k miles. Excellent bodywork, Full Black Nevada leather throughout, with Piano black trim as extra. Recently fitted with two new front tyres and fully serviced 6/6/16 at BMW Stockport. Excellent Condition throughout. Four wheel-drive, 20 inch Y-spoke style 336 alloy wheels. Reversing assist camera with running boards aluminium. Roof Rails black. Air Conditioning for front and back seat with Third seat rear as extra, electric glass sunroof. Sun protection glass. Alarm system, factory tracker fitted. Anthracite headlining, Auto dimming rear view mirror, Automatic dimming exterior folding mirrors, Enhanced Bluetooth handsfree system, BMW Assist online portal, internet, BMW professional loudspeaker system, BMW Professional navigation system, DVD system rear, media package, dynamic package, DAB digital radio, USB Audio interface, Electric front seats with driver memory, Extended interior light package, First aid kit and triangle, Front and rear park distance control (PDC), Front Comfort seats, Front sport seats, Heated seats front and back! Headlight wash, High-gloss Shadowline exterior trim, Powered bootlid operation., Rain sensor with automatic headlight activation, this car pretty much has everything! real head turner!, owners(Myself and BMW), Next MOT due 25/11/2016, Full service history, Electric windows, Air conditioning, Satellite navigation, Parking aid, DVD, MP3 player, CD player, Leather trim, Heated seats, Height adjustable driver's seat, Height adjustable passenger seat, Folding rear seats, Child seat points (Isofix system), Sports seats, 20" Alloy Wheels, Power steering, Steering wheel rake adjustment, Cruise control, Traction control, Roof rails, Central locking, Alarm, Immobiliser, Driver's airbags, Passenger airbags. WHITE, £29,999 priced to sell, no offers or part exchange or time wasters. The car does not not have heads up display.